Flower strong red with dark red spotting in the dorsal throat, wavy edges, broadly funnel-campanulate, 3⅛" across. Domed-shaped truss holds 14 flowers. Blooms midseason. Leaves elliptic, heavy textured, 5" long, dull, mid to dark green. Dense, upright plant habit. Thrives in heat and sun. Grows to a height of 5 ft. or more in 10 years. Cold hardy to -5°F (-21°C). Hybridized by van Nes & Sons. Flower brilliant violet, with no markings. Flat saucer-shaped, wavy lobes, 2" across. Held in trusses with 3 flowers. Blooms early midseason. Leaves elliptic, acute apex, cuneate base, 1½" to 2" long, yellow-green, retained for 2 years. Plant has upright habit. New growth bronze yellow. Grows to a height of 5 ft. in 10 years. Cold hardy to -5°F (-21°C). Hybridized by Phetteplace. 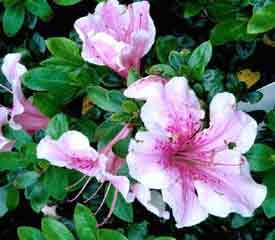 Flower white flushed and marked deep pink, single, funnel-shaped, wavy-edges, 2½ - 3" across. Blooms late midseason to late. Leaves elliptic, ½" long, glossy, dark green. Grows wider than tall. Grows to a typical height of about 2 ft. in 10 years. Hardy to 5°F (-15°C). Hybridizer is unknown. 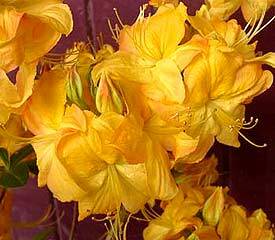 Flower strong yellow, suffused with reddish-orange, with an orange-yellow blotch, funnel-shaped, 2⅜" to 3⅛" across. Ball-shaped truss holds 8-15 flowers. Blooms early midseason to midseason. Deciduous. 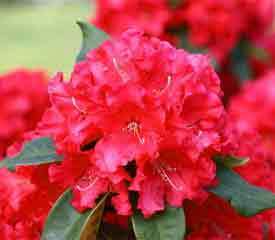 Leaves deep brownish-red when new, deep bronze in autumn, mildew-resistant. Broad, upright, dense growth habit. Height: 5 ft. in 10 years. Cold hardy to -15°F (-26°C). 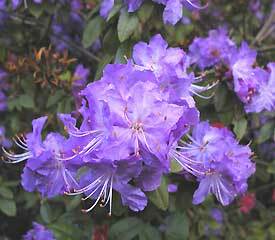 Raised and introduced by Edmund de Rothschild. Winner of the Royal Horticultural Society Award of Garden Merit. Photos (top to bottom) by Courtesy of the Deutsche Genbank Rhododendron, Loyd Newcomb, Don Wallace, Kenneth Cox.